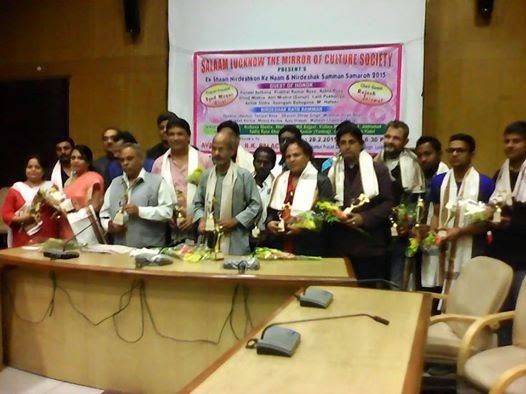 Mirror of Culture Society organized Salam Lucknow in Jai shankar Prasad auditorium at kaisher bagh. the directors of Kal Aaj Aur Kal's stage play were felicitated by Mr. Rajesh Jaiswal and Syed Waqar Rizvi, chief guests. The directors of Kal's stage play, Puneet Asthana, Prabhat Kumar Bose, Achala Bose,Vinod Mishr, Anil Mishr, Lalit Pokharia, Ashok Sinha, Sangam Bahuguna, M.Hafeez, with Amn-e- Samman; the directors of Aaj's stage play, Deshraj, Kamal Bose, Dharam Sri Singh, Manoj Verma, with a gem of directors; and the directors of Kal's stage play(future's stage play), Archana Shukla, Shubham Bajpai, Vishnu Mishra A.S. Abhishekh, Sadique Raja Khan, Santosh Kumar were felicitated with Mr. Directors.